Hope you're having a great summer! Abbey is. 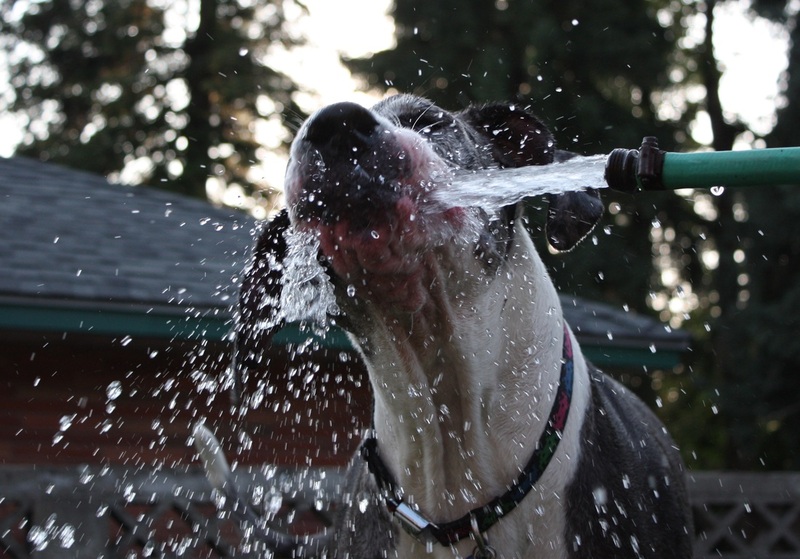 When it's hot, she chomps on the water from the hose! All my life, I've loved animals. 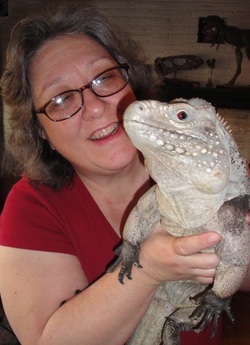 I wanted to be a naturalist before I decided to be a writer because there is nothing better than connecting with critters (connecting with kids is a tie). I don't have hundreds of animals the way I might have dreamed as a kid. But I have a lot more than I had when I was young. I'd love to introduce you to them now. 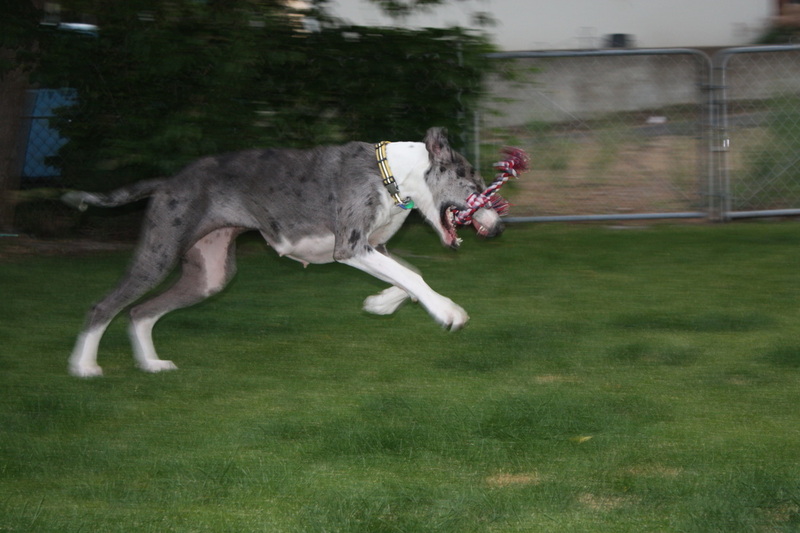 In June of 2012, we adopted Abbey, a three-year-old Great Dane. She was a rescue dog -- an unwanted animal that might not make it without a good, new adoptive home. She weighs 120 pounds and most of that is love. A few pounds are crazy -- the pounds that drive her to chase the kitties. But on the whole, she's nothing but love, and we love her back! Abbey running with her rope toy. This is one very energetic, very happy BIG dog. Just love this animal. ...thinks her name is Pug because by the time we got her, it was too late to change her generic name. She was a pet store puppy dropped and crushed by a careless shopper. They were scheduled to put her to sleep because her leg was so badly injured, when a friend called me and asked me if I'd take her, with three legs. We flew her to Washington and she's been with us ever since. BTW, the vet college was able to rebuild her shattered leg, so she has all four, though the corrected leg doesn't bend and aches a bit now that she's older. 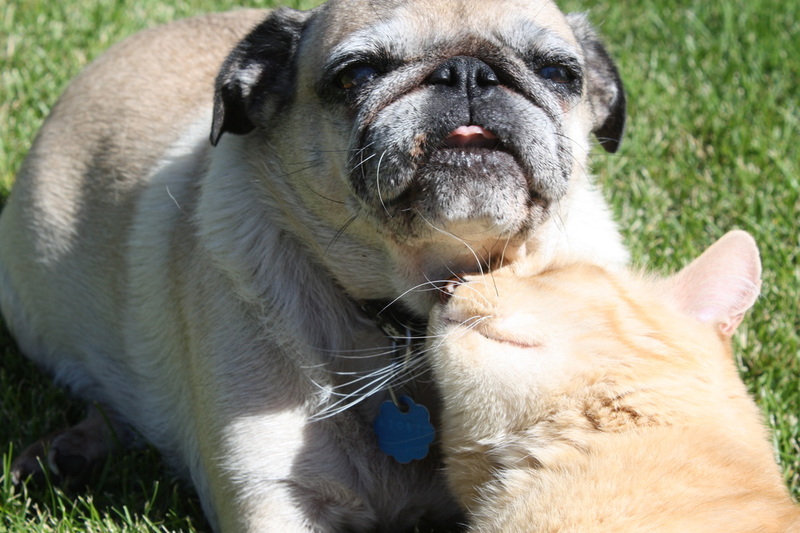 Pug LOVE LOVE LOVES all the kitties, including Pumpkin snuggling with her here. She thinks they are hers. 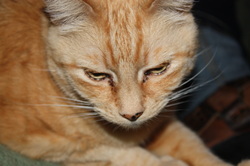 Pumpkin was one of four kittens left to die when my next door neighbors in Colorado sent their mother to the pound. He and his siblings were only 4 days old. We begged the neighbors not to do it. I offered to adopt their mom and have her spayed after the babies were old enough, but they refused. So we took the babies in, bottle fed them and found them good homes. But Punky stayed with us. He's been shot with a BB gun, but it missed all his vital organs, so it's still inside him. Glad we didn't lose him. He has cancer now, but he's still in good health and we'll be sure the rest of his life is good and filled with love. He thinks the Great Dane is interesting, even rubs against her now and then. ...adopted us. He just showed up one day and fought to stay. It took quite a while for the others to accept him, because he was so fearful and distrusting. always hissing and threatening to fight. But after a year, he's settled in. He's still pretty wild, but not the scrapper he was. And he knows he's safe and loved now. 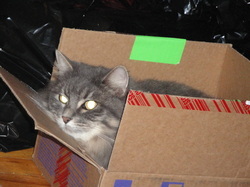 He is in LOVE with cardboard boxes, so I try to have at least one laying around for him. This one is REALLY small, but he loved it. Such a funny little crazy cat. Fluff has adjusted to Abbey fine. He's so tough, no surprises there. But he runs when she chases him. He's tough, not dumb. 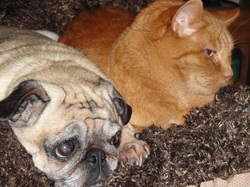 Our dearly departed pets -- gone but never forgotten. 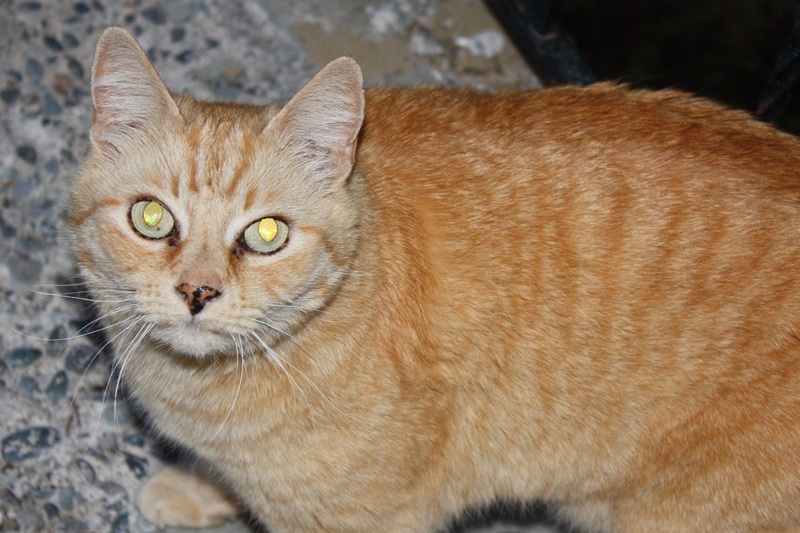 ...also known as Lemon Debbie (even though he's a boy) is the only "adopted" kitty we have. My daughter fell in love with him and brought him home, and he's a real sweetheart. But I try to take in abandoned kitties now because they are so hard to place. People want kittens, not adult babies. But they make such good friends. I wish people would consider adopting adult kitties. Bitty is not a big Abbey fan. He thinks that dog is just too big to trust, and every time Abbey chases him again, she proves he was right. Hope they come to an understanding -- eventually. 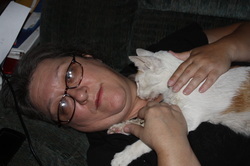 Sadly we lost our sweet Bitty on Monday, March 11, 2013. He took ill, and three days later he was gone. Cancer had spread all over his little body, and he was in terrible pain. Letting him go was the kindest thing we could do. 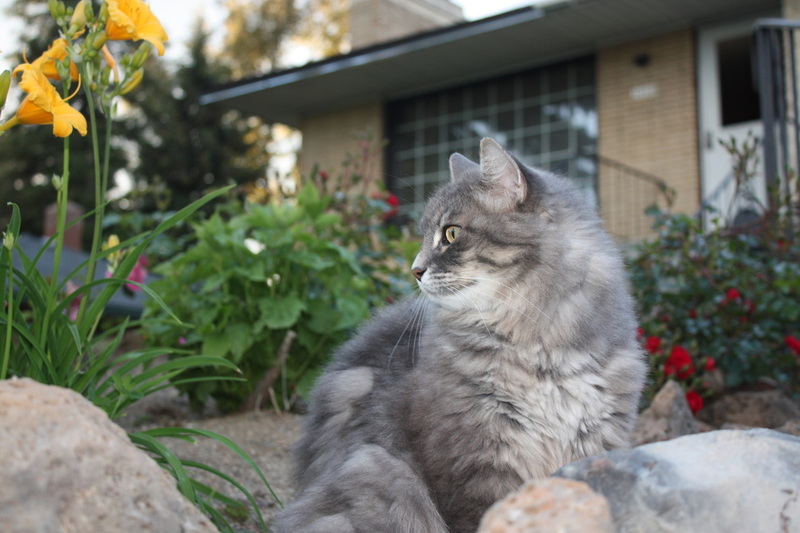 But he was my constant little companion and I'll miss him terribly. Such a sweet little guy. We'll always love him. I found Cat Boy as a kitten inside an air tight cooler. Imagine leaving a kitten to die like that. He's getting older now -- about 16. But he's a sweet old guy. 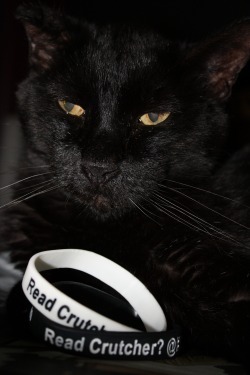 He's posing here with my friend Chris Crutcher's wristbands. If he could read, he'd love CC's books. : ) He is the brother of Pumpkin's mother. Pumpkin is just below Cat Boy here. People think his name is Cowboy because when I call him, I guess that's what it sounds like. 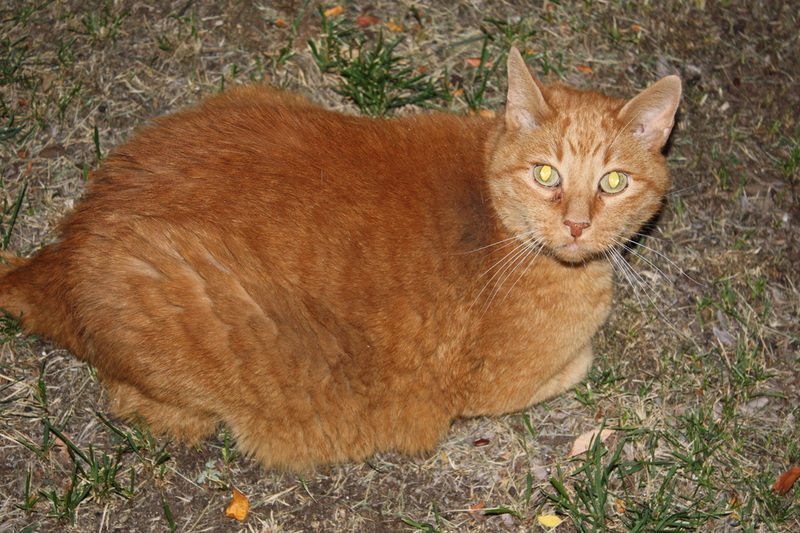 My neighbor calls him Mr. Belvadier, when he camps out at their house -- they are cat people, too. But he's Cat Boy to me. And I love him. SAD NEWS. 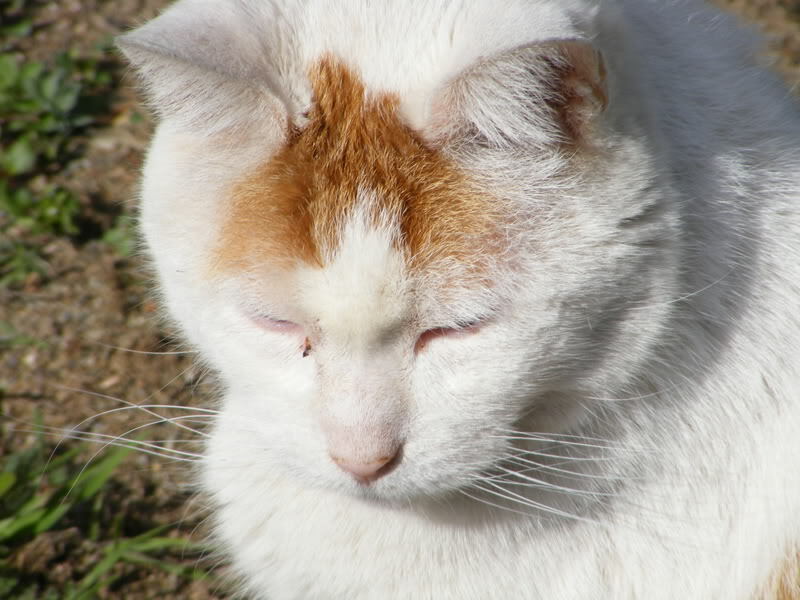 In August of 2011, we lost our beloved Cat Boy. He had cancer. We found out in June and spent a whole lot of money to buy just a few more weeks with him. They were heavenly weeks. We played more. We cuddled more. We had those weeks to soak in his wonderful personality and to say goodbye. When that goodbye came, it broke my heart and I cried for days. 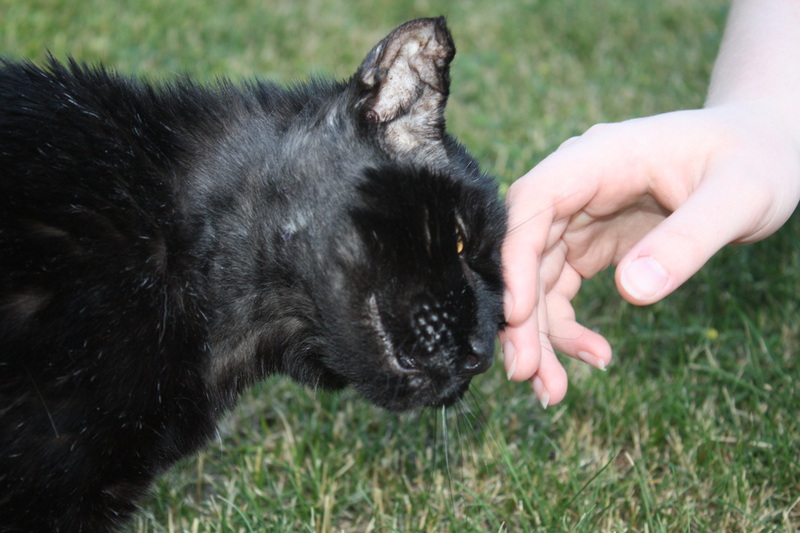 But I wouldn't trade the 16 years we had with the best cat on earth for anything. Pain is part of loving something or someone. In the end, the love out weighed the pain. Miss you, Cat Boy. You'll never be forgotten. ...passed away earlier this year, and it broke my heart. But he was loved while he was here. 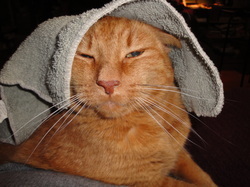 We found him as a tiny little kitten covered in blood by the Spokane River -- tossed down the hill to die. He's missed, but not forgotten. He died later the night this picture was taken, right there next to my heart. He had the BRIGHTEST sky blue eyes. Below is a picture of Pee before he got so sick. Loved him. Yup. ...is obviously NOT a kitty. 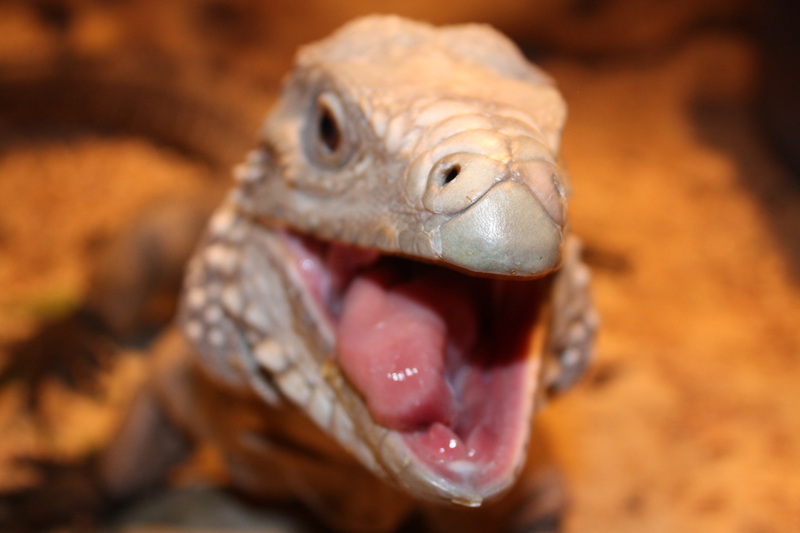 He's a four foot rock iguana, but we love him too. The kitties think he's fascinating. Pug doesn't notice him very often. He's just another citizen in the fun house. : ) I love him completely. 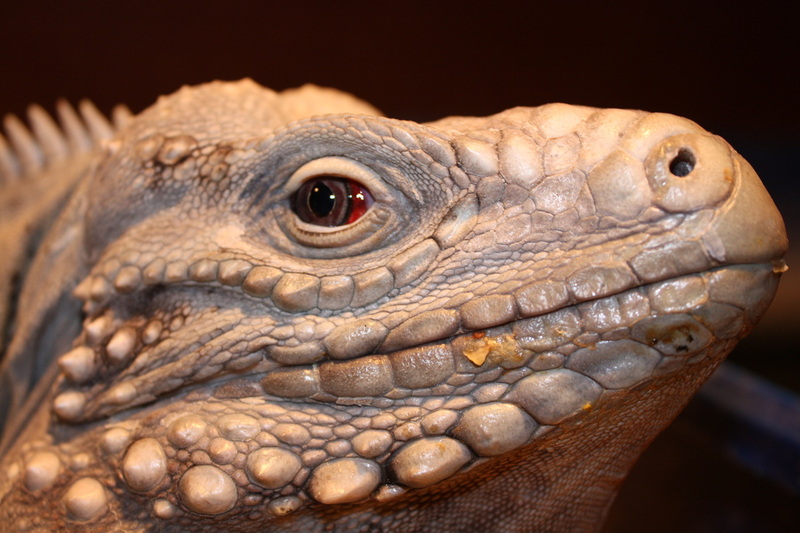 He's simply amazing -- my own little dinosaur.